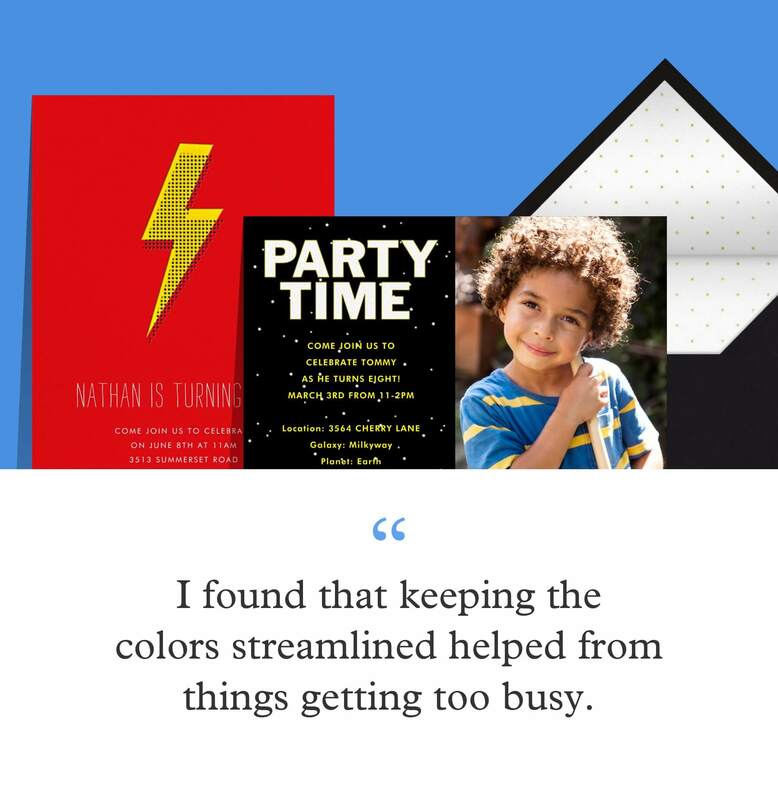 To help plan your next party, we asked Minhee and a few more of our favorite design partners (that also happen to be parents) for their tried-and-true tips. 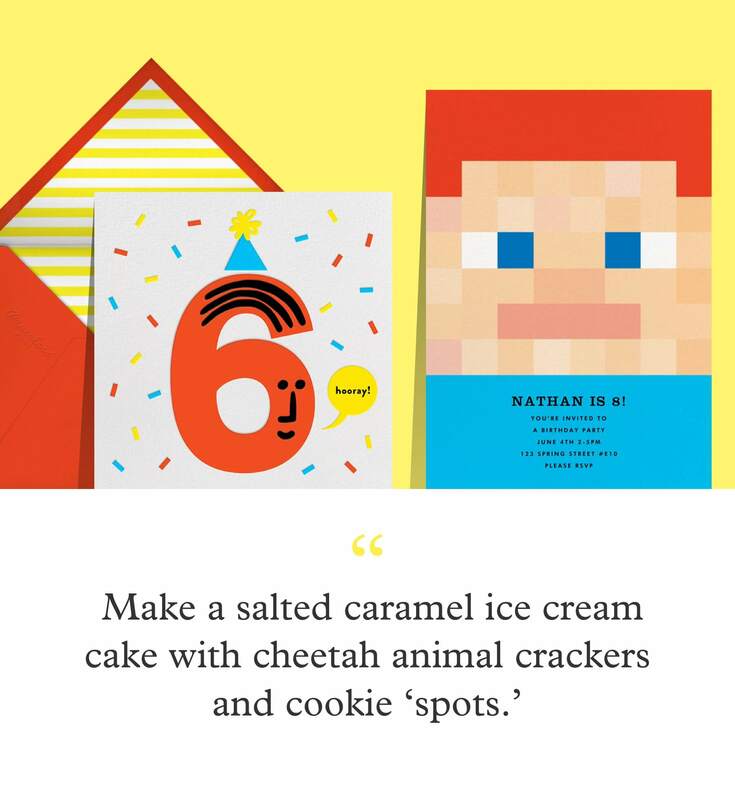 From crowd-pleasing themes that aren’t about the same-old cartoon characters to kids’ birthday party games that’ll get everyone laughing, these ideas put the emphasis on creativity — and fun. Try a theme that inspires activities. 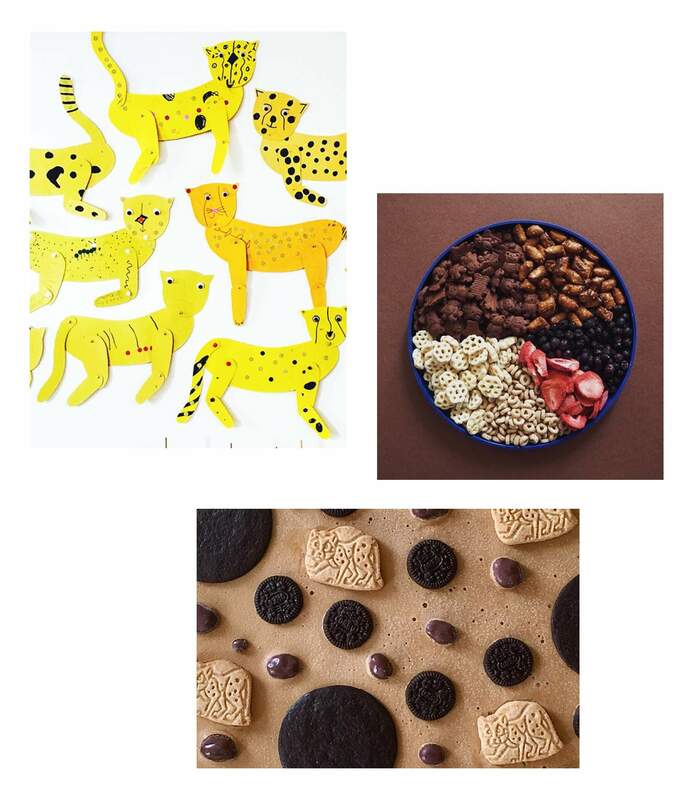 For instance, Minhee’s Oreo-themed party at a park inspired cute decor and an unsurprisingly popular game. “We bought as many different flavors of Oreos as we could find and passed out eye masks, pencils and paper. Each kid had to taste a morsel and guess the flavor,” she said. 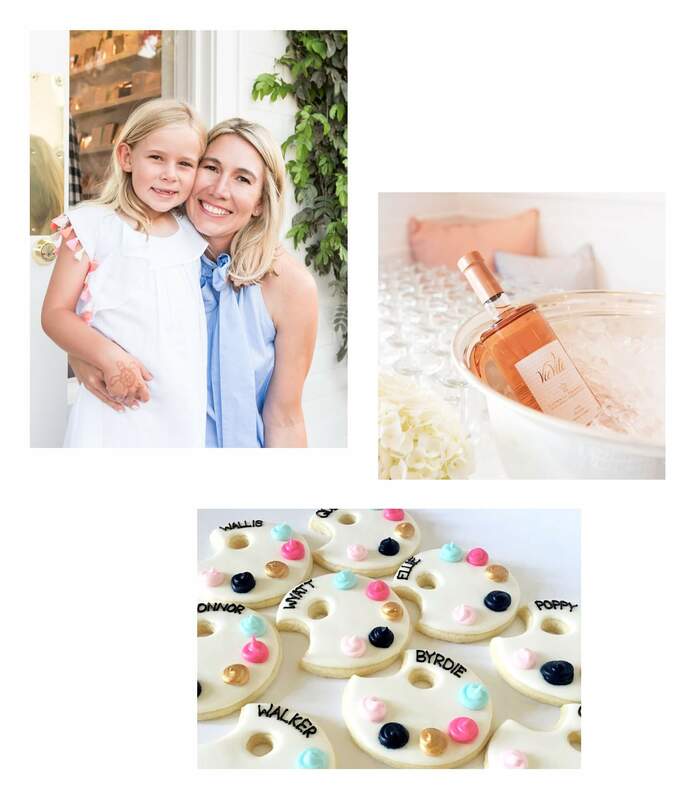 An activity-based theme can open up plenty of possibilities, like the art party Chelsea Shukov of Sugar Paper threw for her daughter. “We brought in an artist who led the kids through several projects that kept them happily occupied while I had time to catch up with friends,” she said. The art theme also translated to the cookies, which were made in the shape of a painter’s palette. “They were an unexpected favor and a huge hit,” Chelsea said. “Birthday Stars” and “Big Birthday Dot” by Sugar Paper. Photos courtesy of Sugar Paper. Cut down on character overload with color. Kids birthday party invitations tend to be heavy with characters, locking you into having to buy coordinating decor that’s also heavy with branded characters. 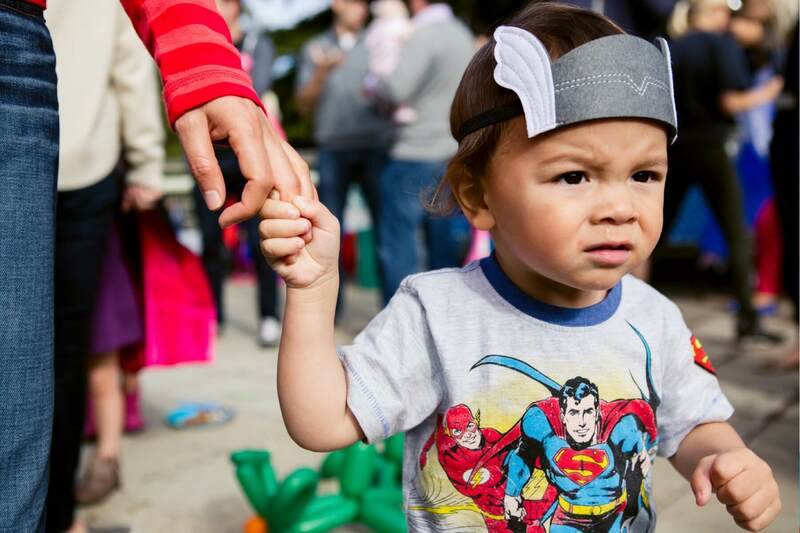 “If your child does want a specific character party, there are ways to make it special without looking like the Pokémon aisle at a party supply store exploded in your living room,” says Erin Jang of The Indigo Bunting. 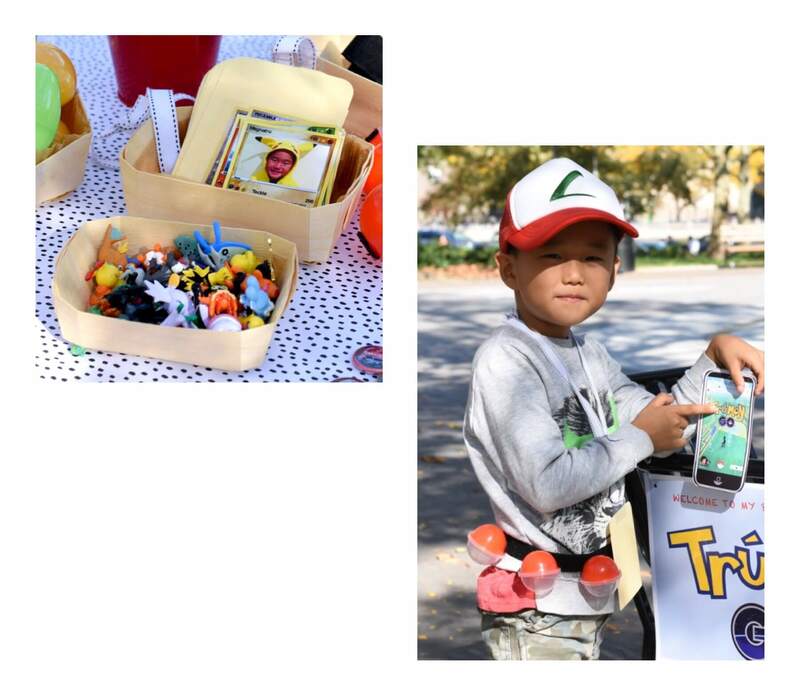 Minhee also threw a Pokémon party for her son Truman and says “I found that keeping the colors streamlined helped from things getting too busy.” They both recommend focusing on invitations that nod to the character with color. For example, yellow and black can convey that “Pokémon” feel (or it can nod to Batman!). Then, pick up cups, plates, balloons and other party must-haves in the same palette. “Pop Bolt” and “Lucky Stars (Photo)” by Paper + Cup. Photos courtesy of Paper + Cup. Turn plain paper and cardboard into special decor. Spending just a little on basic supplies adds up to a lot of fun, not to mention a lot of possibilities. “Butcher paper is really my solution for all the makeshift decor,” says Happy Menocal. “Cover the tables and even the walls, and then have your kids paint on it with big fat brushes — it completely transforms the room.” Colorful construction paper (which is already likely to be in your kids’ activity corner) can also be used in a pinch to create one of Menocal’s favorite decorations. “Paper crowns! 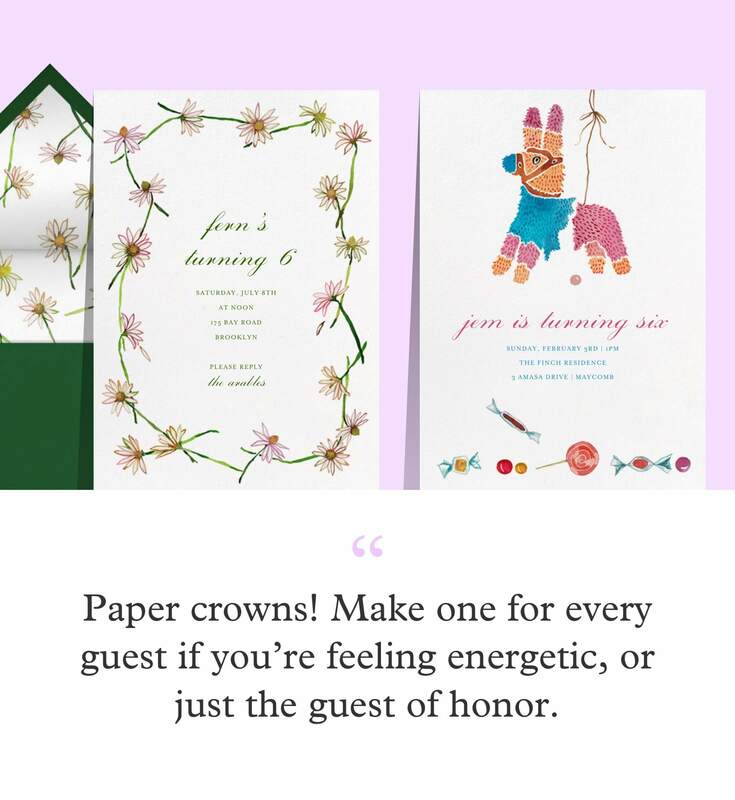 Make one for every guest if you’re feeling energetic, or just the guest of honor,” she said. “Daisy Chain” and “Candy-Filled” by Happy Menocal. Photos courtesy of Happy Menocal. 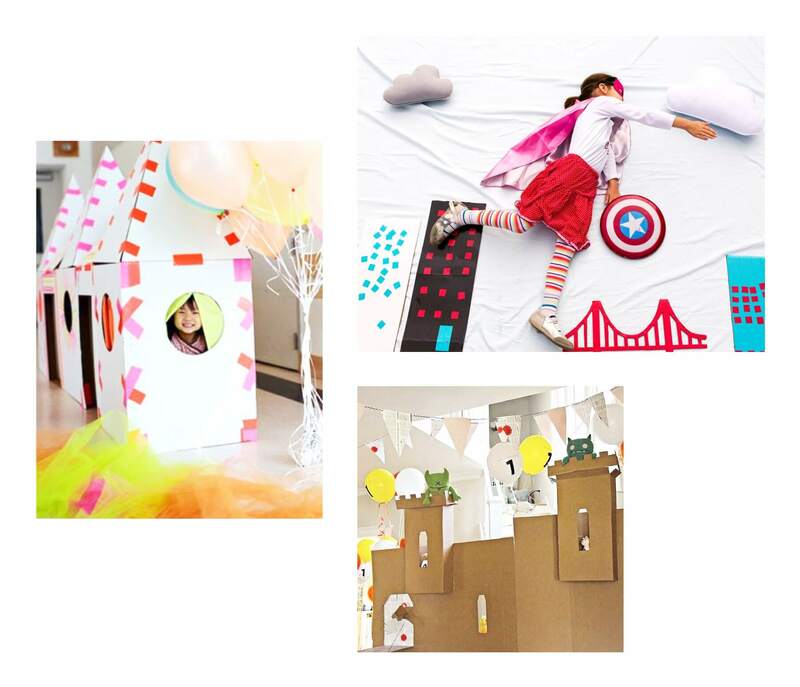 Eunice and Sabrina Moyle of Hello!Lucky use cardboard as a blank slate for their kids’ birthday parties. 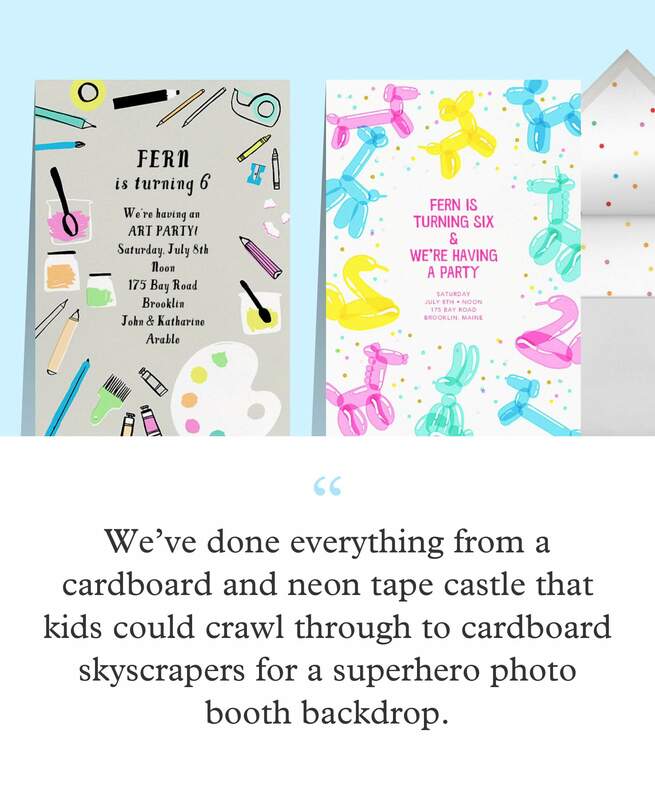 “We’ve done everything from a cardboard and neon tape castle that kids could crawl through to cardboard skyscrapers for a superhero photo booth backdrop,” Eunice said. “Arty Party” and “Balloon Animals” by Hello!Lucky. Opt for “traditional” kids birthday foods. “Birthday Faces” and “Pixel People” by The Indigo Bunting. Photos courtesy of The Indigo Bunting. Add a personal touch to favors. “Gift bags are a great opportunity to teach kids about the joy of giving,” Eunice said. That said, resist the pressure to go overboard with goodie bags. Instead, make a basic favor feel special just by adding each guest’s name. 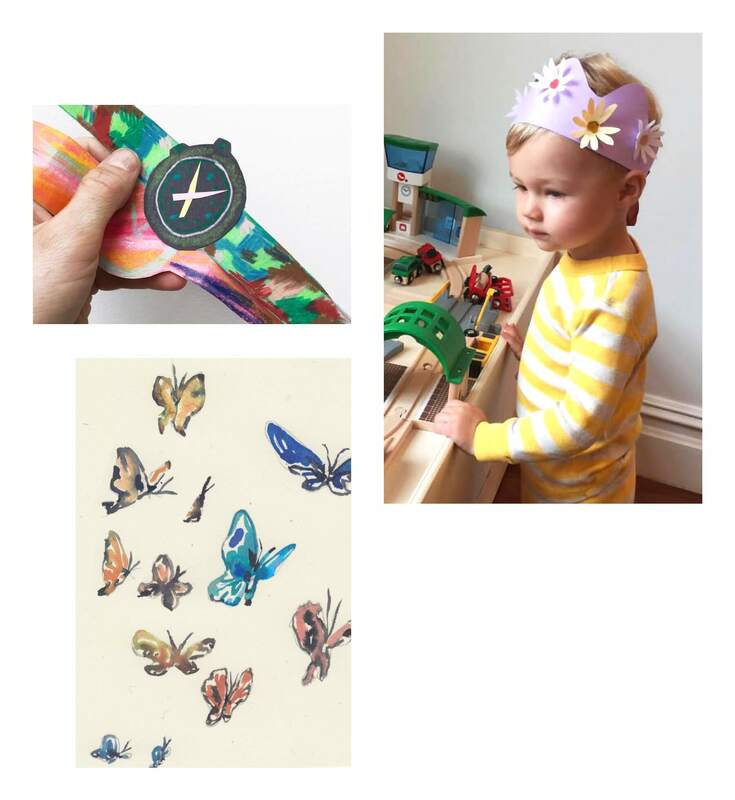 “Personalization doesn’t have to be fancy, it can be as simple as adding sticker names with your child to a notebook!” said Minhee. 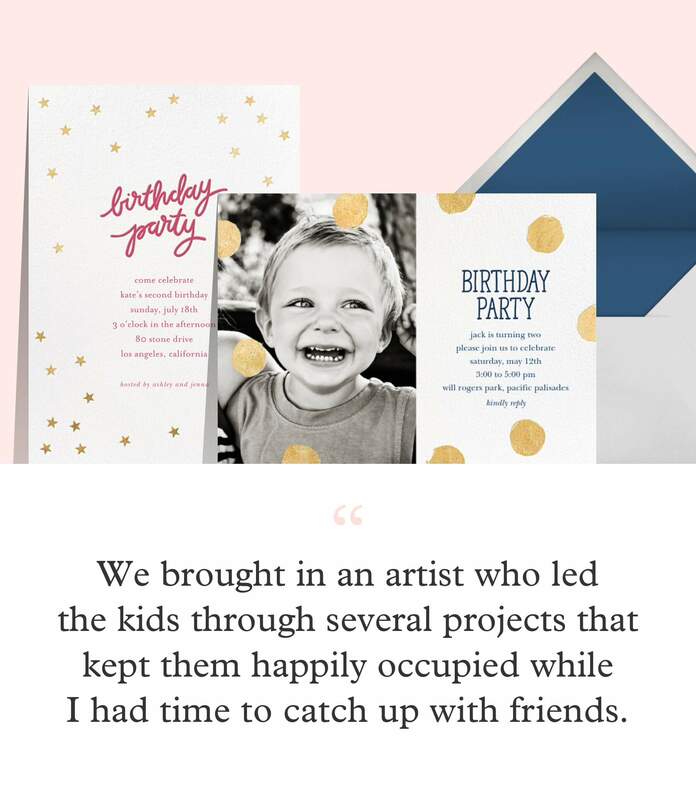 Get inspired for your next celebration by browsing our collection of themed kids’ birthday invitations.